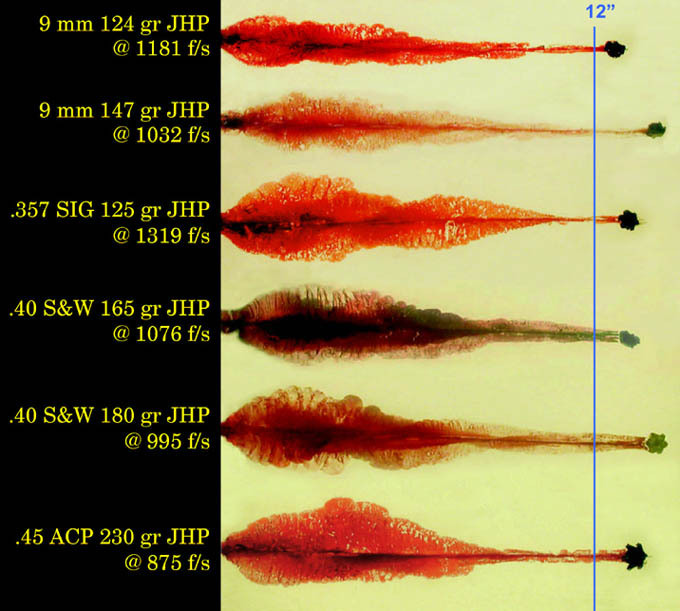 What is the best handgun cartridge and bullet design for you to carry on the street? My standard response to this question is to carry the largest caliber, with the heaviest bullet, loaded as hot as you can handle it in order to deliver two, quick center of mass shots… and have the skills to be able to follow up with a precise shot to the cranio-ocular cavity (between the eyebrows and mustache) when the first two thoracic cavity hits don’t stop an extremely dedicated opponent. The first photo I want you study is the terminal ballistics of various handgun cartridges when shot into ballistic gelatin. Ballistic gelatin is designed to approximate, as closely as possible, the terminal resistance that a bullet encounters when it strikes human flesh. Unfortunately, ballistic gelatin does not have bone structure, joints, nervous system reaction, circulatory hydraulic reaction, movement, or the will to fight. These are just a few of the variables encountered when you use a gun against a human adversary. Note that every cartridge tested penetrates over 12 inches, but take a look at the wound channels. Do you see a difference? The bigger the wound channel, the more damage and the more likely you are to adversely affect bones, joints, the nervous system and circulatory hydraulics – all of which lead to incapacitating your opponent so he stops fighting. Clearly the larger calibers perform best. From this photo, if you are choosing a concealed carry handgun simply on the merit of what works best in ballistic gelatin, then the best choices are clearly defined. However, in a real gunfight, you can throw all of the theory and ballistic gelatin testing out the window, because MINDSET and TRAINING trumps equipment every time. And I’m referring to the mindset and training of both YOU and YOUR OPPONENT. On the street, he who hits first with the most, wins. Shot placement is EVERYTHING. A disciplined and dedicated fighter with any weapon is superior to Joe Average Citizen who just took a one day CCW Course at his local gun range but does not have the mindset or ability to finish the fight. Want proof? Take a look at this report from the FBI after some misinformation regarding an officer involved shooting was disseminated on web forums. Note that the National Tactical Officer’s Association Blog Post was in error regarding the performance of the handgun rounds and thus created the FBI investigation and their subsequent report. 1. Range was 20 feet. 3. One adversary, 18 years old. 4. Officers used M4s with 55 grain and 75 grain .223 ammunition and Glock 22’s with Speer 180 grain Gold Dot ammunition. 5. Adversary used .45 ACP handgun. 6. Trace amounts of marijuana in adversary’s system. 7. 107 rounds fired by two officers with 17 rounds striking adversary (16% hit ratio). 8. Of the 17 hits, 11 created exit wounds. 9. NO HEAD SHOT DELIVERED by officers at range of 20 feet from either their rifles or handguns. 10. Adversary fired 26 rounds and reloaded magazine from a box of loose ammunition. 11. Incident lasted approximately 3.5 minutes. 12. When adversary was no longer able to return fire, officers still had to “fight” to get him handcuffed. 13. Interesting tattoos on very dedicated adversary. 14. I would add under the FBI’s Lessons Learned Section that when you do not inflict immediate, incapacitating damage to your adversary, you often create a “Superman Effect” in your adversary from the normal physiologic response to significant, but non-life threatening injury. I experienced this myself when I broke both arms in an all terrain vehicle accident 20 years ago. I distinctly remember looking at both wrists, twisted and broken, but remarkably felt NO PAIN. I was so surprised by the lack of pain that I actually shook the wrists a bit in disbelief! I then crossed my arms, holding the wrists close to my body for support, and JOGGED back toward camp for several minutes before the pain began and then quickly intensified to the point where any movement of my body was extremely painful. It is during this brief but significant period of NO PAIN that your adversary can fight you like a “Superman” even though you may be continuing to deliver hits to his body. The answer to such a dangerous opponent is the cranio-ocular shot. You must have the mindset and ability to slow down and deliver a dedicated shot to the area between your opponent’s eyebrows and mustache to end the fight. If you are so inclined, Front Sight can train and ingrain you to do so. WARNING: Graphic autopsy photos contained within the report. FBI Report – WARNING – Graphic Autopsy Photos Included (PDF) (If you can’t open the above PDF, click here to download free Adobe PDF reader software) I will be posting a different article on this blog each Monday so I look forward to your visit every week. Entry Filed under: Concealed Carry Training,Dr. Ignatius Piazza,Gun Training,Handgun Training,Monday Blog Posts,Self Defense.